Financial Independence KPIs should be part of any portfolio. Just to realize how you are doing. Numbers are the name of the game. Personal expectations are critical. Sometime ago I have realized that investing in mutual funds is a relatively safe bet due to diversification of the portfolio. It does not bring a lot of results. 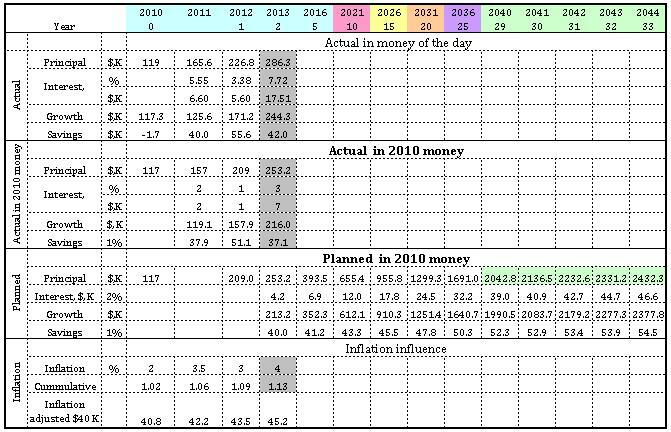 For me investing at $ 40 K a year in 2010 money terms (in 2013 this would mean $ 45K) reaching financial independence would take 29 years (achieved in 2040). There is two basic assumptions: investments will bring 2% above inflation a year, annual savings would go up by 1% , yet again inflation adjusted. Actual in money of the days – figures “as is” at the end of the year. Actual money – inflation adjusted to 2010 money. Planned in 2010 money – this is plan how to get from A to B and achieve $ 2 million dollars in 2010 money. The reason sticking with 2010 money not only symbolic or sentimental. I have reliable data from 2010, otherwise it will always a moving target due to external and internal inflation. By internal I mean increasing our family budget without good reason. One more point is that we recently moved to a more expensive area – while it is providing as better employment opportunities, we are not planning to stay here forever and pay 50% premium once financial independence is reached. - Provide for your annual expenses. - Accumulate enough money to compensate principal for the inflation. In other words if last year inflation was 3% and you have big enough nest egg to live on 3% a year, you need to generate 8% income (additional 2% will go towards taxes on the re-invested money). This is only sustainable way. Less risky strategy – have a bigger nest egg, so you would need lower income (percentage wise). 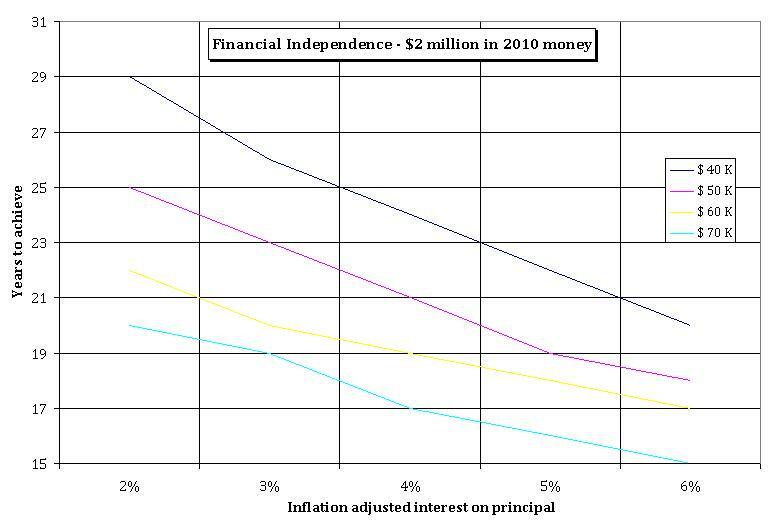 For example with accumulated $ 6 million dollars you would only need to generate 3% above inflation. In comparison with example above 6% instead of 8. In a way it makes me more relaxed with understanding that additional $ 10 K a year could hardly make a big difference in medium to short term. Remember we are talking about 25-30 years period. Assuming that you will go for a safe bet. The better the market performs the less difference it make (additional money put in). - Increasing annual contributions from $40K to $70K buys you 9 years in low growth scenario but only 5 in best case one. - What it could potentially mean that any savings in excess of annually planned $ 42 K I may want to invest in more risky but potentially high return stocks. - Saving additional $ 1 K year on small things (coffee, etc..) and investing it will not buy me an extra year in any scenario.